This 1500mm High Power 30W LED tube in a clear embodiment with 6000 Kelvin color temperature (daylight white) is our current lumen output star. It creates a luminous flux of 3815 lumen and an impressive 126 lumen/watt light output. We also offer an alternative version with a frosted tube body. This 1500mm LED tube in a clear embodiment with 6000 Kelvin color temperature (daylight white) is our current lumen output star. It creates a luminous flux of 3815 lumen and an impressive 126 lumen/watt light output. With a very energy-efficient power consumption of 30.3 watts only. We also offer an alternative version with a frosted tube body. The optimized thermal management ensures temperatures at the heat sink of max. 45 ° C. An important feature to ensure a long life of LED T8 tubes. The operating temperature range is -20 ° C to 65 °C. With a color rendering index of CRI greater than 84, the LED tube produces a very good color reproduction, making it ideal for use in commercial, industrial, factory buildings, production halls, workshops, warehouses and car parks and underground garages suitable. Optimized T8 lED tube fpr professional use! The 150cm neon tubes are the most commonly used in the industry. The diameter of 26mm makes this T8 Tube easy to exchange into the lamp body, where other G13-LED tubes do not fit because they are too thick. Please note before buying whether a glare effect can be caused by the LED. Especially the G13 LED-tubes in a clear body have a very high brightness production and can produce a brief glare of the employees, depending on the application (low ceilings, loading with a forklift, high view at the ceiling). This could result in a hazardous situation. In these cases, we recommend the use of frosted LED T8 tubes. The T8- LED-tube is well suited for the professional use in the industry, manufacturing plants, workshops, offices, warehouses, offices and car parks. This G13 LED with 150 cm length is one of our best selling tubes in the professional sector and can replace a conventional 58 watt fluorescent tube. 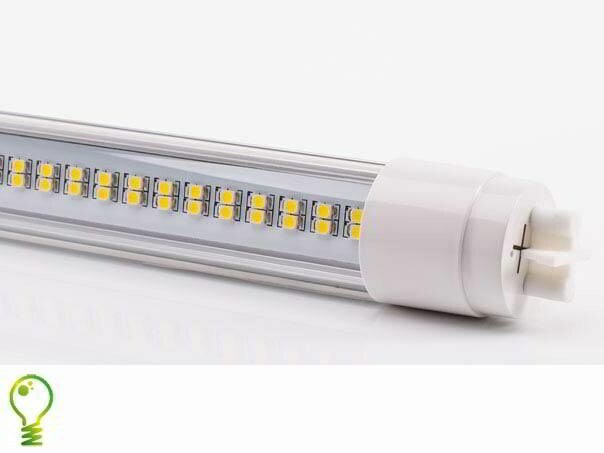 LED tube with G13 socket is designed to meet high professional quality demands for long-term stability, low thermal emission and constant luminosity from professional users in offices, industry, offices and retail shops. We only offer LED tubes that can meet these standards. Further advantages of LED tubes in the professional sector are savings due to extended maintenance cycles in the Facility Management. 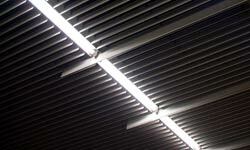 LED tubes have much longer maintenance intervals compared with conventional fluorescent tube. You want to replace your existing lighting system in a energy-efficient way? Feel free to get in contact personally. You can contact us through telephone 0049-221-9924573 during our business hours. 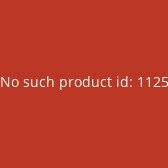 You can also send us an e-mail through our contact form or get in contact through fax. We will respond personally. We ship from Germany throughout Europe. Larger quantities of G13 LED-tubes at discounted conditions can be supplied. Please get in contact. Light data is available and can be provided to be used in light-planning applications. 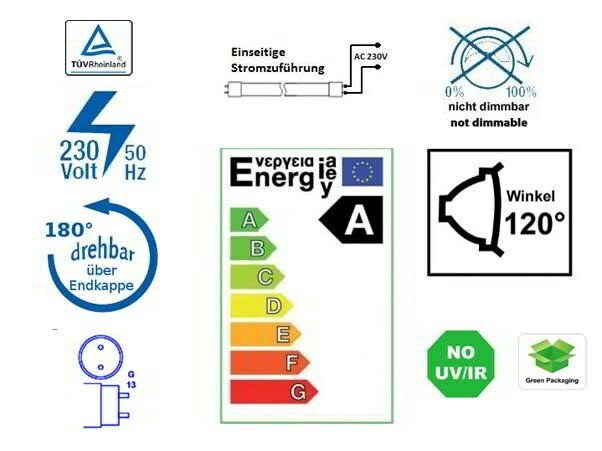 Can you really save electricity costs, buying a 40 Euro LED-tube compared to a 3 Euro fluorescent tube? Yes! Especially in companies with long operating times of the lamps.It does not matter whether it is a company with 2 -or 500 employees. Efficiency criteria of T8 or T5 LED tubes are the daily operating-time (uptime or opening hours in retail), the much longer life of LED tubes but also the lower maintenance expense. Power saving LED tube: 50% or more are possible. 150cm 58 watts/unit * 22-23 watts around 60% industry and commercial environment. *The classic fluorescent lamp is always operated in conjunction with a ballast (SG **, ** ECG, CCG **). This consumes additional power and that can account for up to 15 watts per bulb. In the simple replacement of fluorescent lamp with SG against a LED tube, the ballast will continue to operate. It may be more economical to replace the entire lamp. A normal fluorescent lamp has an average life time of about 10,000-12,000 hours. LED tubes are usually indicated with 50,000 hours or more.This is also true for the individual LEDs installed. Realistically, is an average life between 30,000-40,000 hours.This is due to the built-in electronic components (capacitors / triacs) that are subject to a quicker wear. With very cheap LED tubes downtimes after 2-3 months can often be observed. Get advise from a competent contact person, before you purchase. Amortization: Between 1.5-3 years is normal. In the commercial sector with weekly working hours from 40 hours to 24-hour shift system can be quite short payback periods of 1-3 years to achieve and achieve an attractive return on the investment thereafter. In many cases, the power savings is higher than the monthly burden of financing the conversion. image shows replacement of 58W fluorescent tube against 25W LED tubes. Lower power consumption and better light with higher contrasts. It can be assumed that the price of electricity continues to rise in the future and the calculation thus continued to develop positively. An accurate inventory of existing lighting is important. This is associated with some effort, but it pays to be very working basis. Individual payback calculation for your LED project. LED tubes are high-priced: We wait with the purchase! Without a doubt, rethinking is required! The change of the fluorescent tube as a pure consumables towards greater investment must be explained to the companies. Even with declining LED prices and better products, it is not worth waiting. With the currently high electricity prices, great savings can be achieved, which can eventually pay for itself. An investment in the latest technology allows you to lift a high savings now. Are the LED tubes amortized and have achieved a significant return, you can you still invest in the next-generation of LEDs. Compared to the classical fluorescent tube LED Tube will start immediately. Without delay and flicker. Flickering neon lights interfere with the visual perception and have a direct negative impact on the quality of work.Through the direct start, it is also possible to operate the LED tubes directly on a motion detector, because the light is available immediately at full intensity. In addition, LED tubes are insensitive to frequent switching on and off. Even the familiar humming and disturbing noise does not occur with LED tubes. LED tubes as a replacement for fluorescent lamps produce no ultraviolet light component. 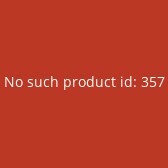 This means that goods, clothing or food do not fade in the retail or age faster. In addition, fewer insects are attracted by LED tubes. 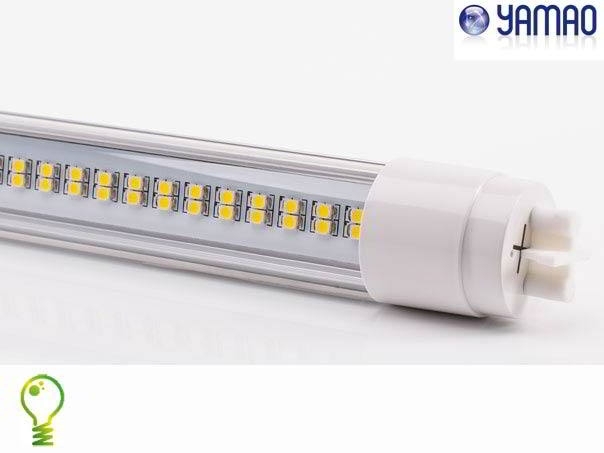 Through the use of LED tubes also reduce maintenance costs, quite worthy to be in larger companies.The frequent exchange of individual tubes or starters omitted. This includes the robustness of the LED tubes. Compared to the fluorescent housing are better protected against shocks or vibration and not break so easily. Compared to fluorescent LED tubes are not filled with polluting gases to be expensively disposed over the hazardous waste. LED tubes are simply disposed of as electronic waste. For companies with high power consumption is usually not charged per kilowatt-hour special on a performance-based measure of utility. It is calculated with the retrieved peak load, which is calculated mostly from the mean of the two monthly peaks. With a consistent transition to LED lower your base load permanently. In companies with a high percentage of machines, the reactive current issue comes into play. The reactive current is compared to the active current provided by the electricity company but can not be used. But it must be paid for it if the factor cos phi is <0.9. This will be listed separately on the electricity bill. 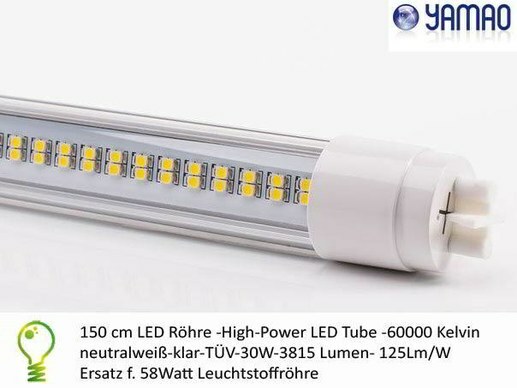 Good LED bulbs have a power factor> 0.95 and are not covered.Traditional fluorescent tubes with CCG have a power factor of 0.3-0.4 and usually have to be compensated by additional capacitors.